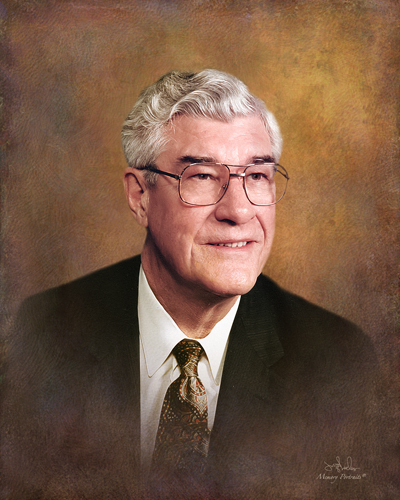 James Wesley Hightower, age 92, passed away Tuesday, February 05, 2019, at his residence in Waxahachie. He was born November 6, 1926 in Waxahachie, Texas to Leo and Gladys Hightower. He graduated from Waxahachie High School in 1945 where he was the captain of the football team and Golden Glove Boxing champion. James married his high school sweetheart, Jimylin Wise, on February 2, 1946 and they celebrated 72 years of marriage before her death on February 5, 2018 exactly one year prior to James’ passing. James was offered football scholarships to both TCU and Rice, but had to decline because of the war. James was in the 98th field artillery stationed at Fort Sill, Oklahoma, during World War ll. After the war, he attended TCU undergraduate and Baylor Law School. He worked as a lobbyist for the Texas Motor Transportation Association for two legislative sessions, and then started his own law firm in Dallas working primarily as a transportation attorney, practicing before the Interstate Commerce Commission, the Texas Railroad Commission, and all state and federal courts, including the United States Supreme Court until his retirement in 1995. This allowed James and Jimylin to move from Dallas back to Waxahachie in 1989. James was then active in civic affairs in the city and Ellis county and served eight years as president of the Ellis County Rural Rail Transportation District. He also served as president of the Waxahachie Foundation, and president of the Waxahachie Ex-Students Association. Both James and Jimylin were members of the Historic Waxahachie, Inc. HWI. James served as Chairman’s Roundtable Division Leader for the YMCA Youth Sponsorship Campaign for the years of 1997 and 2000. James also enjoyed the pleasure being a Master Gardner. James is survived by his children, Laurie and her husband Richard Todd of Waxahachie; son Wesley Hightower and wife Kim of Ft. Worth. His grandchildren are James Bryant and wife Jennifer of Hurst, Melanie Lamb and husband Keith of Waxahachie, Colton Hightower of Dallas, McKenzie Hightower of Washington D.C., Amber Accidentale and husband Ron of Plano, IL., Shannon Lopez of El Paso, Wes LaForce and wife Marianna of Houston. He is also survived by great-grandchildren, Amelia Lamb, Arieanna, Jamie and Mason Accidentale, Alex Corona, Hudson Lopez, and Oriana LaForce. James would have wanted us to give special recognition to his devoted and loving caregiver, Mandy Scott. He was preceded in death by his wife, Jimylin, his parents, his daughter, Jamie LaForce and his sister, Mildred Staples. Visitation for family and friends will be held from 1:00 to 2:00 P.M. Saturday, February 9, 2019 at the Wayne Boze Funeral Home. Services to celebrate his life will be held at 2:00 P.M. Saturday, February 9, 2019, in the Pat Boze Memorial Chapel of Wayne Boze Funeral Home with Kevin Tully officiating. Interment will follow at the Waxahachie City Cemetary.